Thought leadership is important for building careers and for building organizations. It is the most important tool we have as professionals to build our personal brand and establish credibility. What is thought leadership? How does one build thought leadership in his/her area of work? 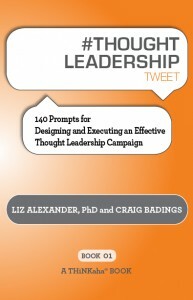 Let’s find out from Dr. Liz Alexander who recently co-authored a book titled ThoughtLeadership Tweet. In the following interview, Liz shares her ideas on how authentic thought leadership is established. 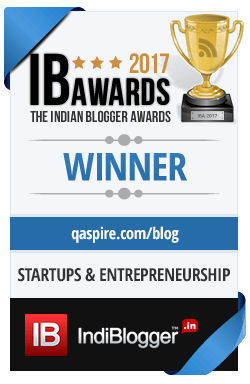 [Tanmay Vora] Liz, when I started my own blog in 2006, I had no idea about the concept of thought leadership. But our world is getting hyper-connected and hyper-competitive and clearly, building thought leadership is the best way to attract opportunities. For the benefit of readers of this blog, how would you define a thought leader? [Liz Alexander] I consider true thought leaders—not content curators, subject matter experts, or trusted advisors who frequently adopt the label—as those who disrupt others’ habitual approaches to issues that concern organizations, industries, or society at large. My co-author Craig Badings and I describe them as advancing the marketplace of ideas by positing actionable, relevant, research-backed, new points of view. My rule of thumb? If you’re calling yourself a thought leader, likely you’re not. It’s a term bestowed on you by others because of your recognized ability to shift their thinking; it’s not something you get to adopt. [Tanmay Vora] Most people think that having a blog and sending out tweets is a way to build thought leadership. What all goes into making a thought leader? [Liz Alexander] While undoubtedly it’s important to channel your contributions out into the world, thought leaders require three things: the right environment in which to think (consider that for a moment; how rarely do today’s organizations provide this? ), a strategic focus for those thoughts (again, how many organizations consider up front what they want their thought leadership to achieve? ), and the courage to explore possibilities that the vast majority of people never see. Let me say a little more about that. Natural thought leaders foster their curiosity, are brave enough to challenge established points of view and willing to explore approaches that may appear controversial, at least at first. Wipro’s concept of Intelligent Terminals; Blue Dart Express’ championing of corporate social responsibility in India through their “Living Corporate Responsibility” campaign; the Gujarat Cooperative Milk Marketing Federation’s AMUL model that champions farmer empowerment– these are all examples of organizations who looked broader, thought deeper, reached higher. True thought leadership in action! [Tanmay Vora] What is the role of “real accomplishments” in being a thought leader? I mean, when we talk about “thought leadership”, is there something called “act leadership” or leadership by doing things? [Liz Alexander] I was struck by an analogy I read that described thought leaders as people who sold you tickets for the bus tour, but weren’t necessarily driving the bus. That is, they are doing the thinking that intrigues, inspires and incites others to take the necessary tactical action, such as the three examples given above. They innovate conversations rather than offer up cookie-cutter tactics. Thought leadership, in order to have any value, must provoke meaningful change. One of the most important “acts” that thought leaders inspire in others is to get them to think through the practical, personalized implications of adopting a new perspective or way of perceiving their industry, organization, or customer base. [Tanmay Vora] What are the key lessons individuals can take away from your book #THOUGHT LEADERSHIP tweet? [Liz Alexander] That there is more to designing and executing a successful, effective thought leadership campaign than most people realize. We’ve done the preliminary thinking for readers by compiling 140 tweet-sized prompts with which organizations can review their existing culture (Tweet # 14: Is your environment supportive of a culture of innovation? How have you demonstrated that in the past? ); determine their strategic focus (Tweet #34: What is it you want your target audience to do when they receive or interact with your thought leadership point of view? ); and ensure the right people are campaign champions (Tweet #109: Who will be involved and how in the design, development, and execution of your thought leadership campaign? Why did you choose those people?). [Tanmay Vora] Thank you Liz, for sharing your ideas and book with the readers of this blog. I am sure they will pick some important clues to build their own thought leadership. [Liz Alexander] I’m grateful for the opportunity, Tanmay. Thank you! Will check out the book!